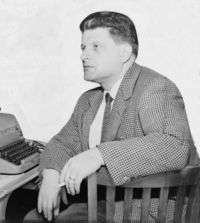 Sidney Aaron "Paddy" Chayefsky (January 29, 1923 – August 1, 1981) was an American playwright, screenwriter and novelist. He is the only person to have won three solo Academy Awards for Best Screenplay (the other three-time winners, Francis Ford Coppola, Charles Brackett, Woody Allen and Billy Wilder, have all shared their awards with co-writers). He was considered one of the most renowned dramatists of the so-called Golden Age of Television. His intimate, realistic scripts provided a naturalistic style of television drama for the 1950s, and he was regarded as the central figure in the "kitchen sink realism" movement of American television. Martin Gottfried wrote in All His Jazz that Chayefsky "was a successful writer, the most successful graduate of television's slice of life school of naturalism." Following his critically acclaimed teleplays, Chayefsky continued to succeed as a playwright and novelist. As a screenwriter, he received three Academy Awards for Marty (1955), The Hospital (1971) and Network (1976). The movie Marty was based on his own television drama about a relationship between two lonely people finding love. Network was his scathing satire of the television industry and The Hospital was also satiric. Film historian David Thomson called The Hospital "daring, uninhibited, and prophetic. No one else would have dreamed of doing it." Chayefsky's early stories were frequently influenced by the author's childhood in The Bronx. Chayefsky was part of the inaugural class of inductees into the Academy of Television Arts & Sciences' Television Hall of Fame. He received this honor three years after his death, in 1984. Chayefsky as a senior in high school, 1939. He was born in The Bronx, New York City to Ukrainian Jewish parents, Harry and Gussie Stuchevsky Chayefsky. He attended DeWitt Clinton High School, and then the City College of New York. While there, he played for the semi-professional football team Kingsbridge Trojans. He graduated with a degree in accounting in 1943, and then studied languages at Fordham University. During World War II, he joined the United States Army, where he received both a Purple Heart and the nickname "Paddy". The nickname was given spontaneously when Chayefsky was awakened at dawn for kitchen duty. Although actually Jewish, he asked to be excused to attend Mass. "Okay, Paddy," said the officer, and the name stuck. Serving with the 104th Infantry Division in the European Theatre, he was near Aachen, Germany when he was wounded, reportedly by a land mine. While recovering from his injuries in the Army Hospital near Cirencester, England, he wrote the book and lyrics to a musical comedy, No T.O. for Love. First produced in 1945 by the Special Services Unit, the show toured European Army bases for two years. The London opening of No T.O. for Love at the Scala Theatre in the West End was the beginning of Chayefsky's theatrical career. During the London production of this musical, Chayefsky encountered Joshua Logan, a future collaborator, and Garson Kanin, who invited Chayefsky to collaborate with him on a documentary of the Allied invasion, The True Glory. Returning to the United States, Chayefsky worked in his uncle's print shop, Regal Press, an experience which provided a background for his later teleplay, Printer's Measure (1953), as well as his story for the movie As Young as You Feel(1951). Kanin enabled Chayefsky to spend time working on his second play, Put Them All Together (later known as M is for Mother), but it was never produced. Producers Mike Gordon and Jerry Bressler gave him a junior writer's contract. He wrote a story, The Great American Hoax, which sold to Good Housekeeping but was never published. What? He relocated to Hollywood, where he met his future wife Susan Sackler, and the couple married in February 1949. Failing to find work on the West Coast, Chayefsky returned to New York. During the late 1940s, he began working full-time on short stories and radio scripts, and during that period, he was a gagwriter for radio host Robert Q. Lewis. Chayefsky later recalled, "I sold some plays to men who had an uncanny ability not to raise money." During 1951–52, Chayefsky wrote adaptations for radio's Theater Guild on the Air: The Meanest Man in the World (with James Stewart), Cavalcade of America, Tommy (with Van Heflin and Ruth Gordon) and Over 21 (with Wally Cox). His play The Man Who Made the Mountain Shake was noticed by Elia Kazan, and his wife, Molly Kazan, helped Chayefsky with revisions. It was retitled Fifth From Garibaldi but was never produced. In 1951, the movie As Young as You Feel was adapted from a Chayefsky story. He moved into television with scripts for Danger, The Gulf Playhouse and Manhunt. Philco Television Playhouse producer Fred Coe saw the Danger and Manhunt episodes and enlisted Chayefsky to adapt the story It Happened on the Brooklyn Subway about a photographer on a New York subway train who reunites a concentration camp survivor with his long-lost wife. Chayefsky's first script to be telecast was a 1949 adaptation of Budd Schulberg's What Makes Sammy Run? for Philco. Since he had always wanted to use a synagogue as backdrop, he wrote Holiday Song, telecast in 1952 and also in 1954. He submitted more work to Philco, including Printer's Measure, The Bachelor Party (1953) and The Big Deal (1953). One of these teleplays, Mother (April 4, 1954), received a new production October 24, 1994 on Great Performances with Anne Bancroft in the title role. Curiously, original teleplays from the 1950s are almost never revived for new TV productions, so the 1994 production of Mother was a conspicuous rarity. In 1953, Chayefsky wrote Marty, which was premiered on The Philco Television Playhouse, with Rod Steiger and Nancy Marchand. Marty is about a decent, hard-working Bronx butcher, pining for the company of a woman in his life but despairing of ever finding true love in a relationship. Fate pairs him with a plain, shy schoolteacher named Clara whom he rescues from the embarrassment of being abandoned by her blind date in a local dance hall. The production, the actors and Chayefsky's naturalistic dialogue received much critical acclaim and influenced subsequent live television dramas. Chayefsky had a unique clause in his Marty contract that stated that only he could write the screenplay, which he did for the 1955 movie. Chayefsky's The Great American Hoax was broadcast May 15, 1957 during the second season of The 20th Century Fox Hour. This was actually a rewrite of his earlier Fox film, As Young as You Feel (1951) with Monty Woolley and Marilyn Monroe. The Great American Hoax was shown on the FX channel after Fox restored some The 20th Century Fox Hour episodes and telecast them under the new title Fox Hour of Stars beginning in 2002. The seventh season of Philco Television Playhouse began September 19, 1954 with E. G. Marshall and Eva Marie Saint in Chayefsky's Middle of the Night, a play which relocated to Broadway theaters 15 months later; In 1956, Middle of the Night opened on Broadway with Edward G. Robinson and Gena Rowlands, and its success led to a national tour. It was filmed by Columbia Pictures in 1959 with Kim Novak and Fredric March. The Tenth Man (1959) marked Chayefsky's second Broadway theatrical success, garnering 1960 Tony Award nominations for Best Play, Best Director (Tyrone Guthrie) and Best Scenic Design. Guthrie received another nomination for Chayefsky's Gideon, as did actor Fredric March. Chayefsky's final Broadway theatrical production, a play based on the life of Joseph Stalin, The Passion of Josef D, received unfavorable reviews and ran for only 15 performances. Although Chayefsky was an early writer for the television medium, he eventually abandoned it, "decrying the lack of interest the networks demonstrated toward quality programming". As a result, during the course of his career, he constantly toyed with the idea of lampooning the television industry, which he succeeded in doing with Network. The film is said to have "presaged the advent of reality television by twenty years" and was a "sardonic satire" of the television industry, dealing with the "dehumanization of modern life." Inspired by the work of John C. Lilly, Chayefsky spent two years in Boston doing research to write his science fiction novel Altered States (HarperCollins, 1978) about a man's search for his primal self through psychotropic drugs and an isolation tank. Chayefsky suffered greatly from stress while working on the novel, resulting in his heart attack in 1977. Subsequent to that misfortune, he was sued by one of the numerous scientific advisors he hired to help him with research. He wrote the screenplay for the 1980 film, but he is credited by his real first and middle name, Sidney Aaron, because of disputes with director Ken Russell. "Chayefsky was a sturdy man of 42, compact and burly in the bulky way of a schoolyard athlete, with thick dark hair and a bent nose that could pass for a streetfighter's. He was a grown-up with one foot in the boys' clubs of his city youth, a street snob who would not allow the loss of his nostalgia. He was an intellectual competitor, always spoiling for a political argument or a philosophical argument, or any exchange over any issue, changing sides for the fun of the fray. A liberal, he was annoyed by liberals; a proud Jew, he wouldn't let anyone call him a 'Jewish writer'. In short, the life of the mind was a participant sport for Paddy Chayefsky." Paddy and Susan (née Sackler) Chayefsky's son Dan was born six years after their 1949 marriage. Despite an alleged affair with Kim Novak, Paddy Chayefsky remained married to Susan Chayefsky until his death. Chayefsky died in New York City of cancer, for which he had declined surgery, in 1981, aged 58, and was interred in the Sharon Gardens Division of Kensico Cemetery in Valhalla, Westchester County, New York. His personal papers are at the Wisconsin Historical Society and the New York Public Library for the Performing Arts, Billy Rose Theatre Division. ↑ Profile, nndb.com; accessed June 29, 2015. ↑ Rutherford, Paul.When Television Was Young. University of Toronto Press, 1990. ↑ Quote re Chayefsky, google.com; accessed June 29, 2015. ↑ Karol, Michael (2005-12-15). THE COMIC DNA OF LUCILLE BALL: INTERPRETING THE ICON. iUniverse. ISBN 9780595823208. ↑ Campbell, Colin (2 August 1981). 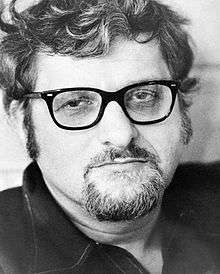 "PADDY CHAYEFSKY DEAD AT 58; PLAYWRIGHT WON THREE OSCARS". The New York Times. Retrieved 16 July 2016. ↑ Considine, Shaun. Mad as Hell: The Life and Work of Paddy Chayefsky, Random House (1995), amazon.com; accessed June 29, 2015. ↑ Internet Broadway Database; accessed June 29, 2015. ↑ McDonald, Brian (2010-11-01). "A Lesson from Paddy Cheyefsky". Retrieved 2010-11-06. Paddy Chayefsky Papers at the Wisconsin Center for Film and Theater Research.